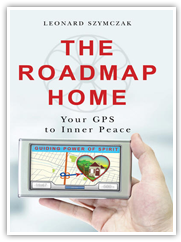 In November I journeyed to Wisconsin to conduct a seminar on The Roadmap Home: Your GPS to Inner Peace. I had the good fortune of staying with my dear friends, Bill and Barb Motlong, who I’ve known for 40 years. As a therapist/photographer, Bill is collaborating with me on a new book which combines his beautiful pictures with inspirational sayings. Like the birds on his farm, Bill rose early to take advantage of his house set in the farm belt of Wisconsin. When I arrived for breakfast, he announced that the day started off with glitches. Barb had a flat tire at the bottom of their winding driveway as she prepared to ferry a friend to hospital. Bill had to exchange cars with her and call triple A. I imagined this crimping our work time set aside for the book. Fortunately, the beautiful fall colors outside their picture windows brought me back to reality. When a tree releases a leaf, everything is in perfect order. That realization punctured our illusions and helped us understand how our egos are the ones actually creating roadblocks. Our expectation that the day proceed a prescribed way prevented us from seeing the wonderful change of events, just like the change of seasons. So we decided to look for the mystical moments that would unfold as a result of a flat tire. Bill and I laughed uproariously. Who were we to judge the way Spirit conveys messages or how the dominoes would fall over unexpected roadblocks. So if you ever experience an obstruction, ask yourself, “Who is really creating the blockage?” Interruptions can puncture your views about what “should” occur and may provide opportunities to meet someone new, to connect on a deeper level, to gain penetrating insight, or to share a heartfelt experience. In the process you may receive unexpected news that you need to replace something broken in your life, even if it’s a tire. When faced with a roadblock, encounter it, embrace it, and evolve on the roadmap home. I recently attended a weeklong spiritual conference on California’s Monterrey peninsula overlooking the Pacific Ocean. Deer roamed freely among the pine trees in this rustic setting – an idyllic place to get spiritually buffed and fluffed. Little did I realize the buffing would begin the first evening when I discovered that my roommate snored. The idea of sharing a room initially seemed like a good way to reduce costs and establish a friendship with a spiritual buddy. However, when my buddy fell fast asleep on his bed, he began inhaling as if his nose was snorting jello. I tried lulling myself to sleep by imagining a gentle brook in a peaceful pasture but my visualization kept morphing into the roar of Niagara Falls. I pondered the notion of six tortuous nights as I listened to the nasal rumba. Sometimes we may not know immediately what Spirit wants us to do but we can quickly discern what we’re NOT meant to do. Like smack my buddy’s head with a pillow. Or tie string around his toe and yank it every time his nasal cavity rumbled. Once we ask and listen, we are ready to receive. I didn’t expect to receive a miracle so quickly. After I had finished writing, the snoring ceased! The silence was unbelievable. I clamored back to my bed but couldn’t sleep. I stayed awake awestruck by the miracle. In the morning I shared my experience with my roommate who was deeply apologetic. I told him that Spirit will help us resolve the problem – if we ask, listen and receive. If you’re wondering how we resolved the problem, the solution came easy. My buddy used a pillow to elevate his head and opened the patio door for fresh air. I obtained ear plugs from the front desk and received more miracles – no snoring during the rest of the conference. Wake-up calls appear in unexpected forms. They provide opportunities to connect with the Guiding Power of Spirit. When we ask for assistance and listen with an open mind, we receive miracles on the road Home to love and inner peace. And in the process, we get spiritually buffed and fluffed. Become the main character in your story! I love stories! We often don’t realize that we are the main characters in our stories. If we want to change our stories, we have to change our narratives, that is, what we think and believe about ourselves, how we present ourselves to others and how we act in the world. The story is up to us. Storymaking can lead us back home when we recognize the narrative and change our lives. 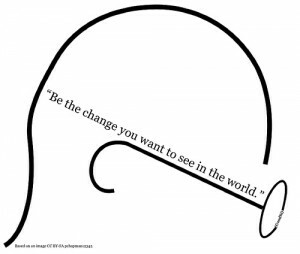 Ghandi said, “Be the change you wish to see in the world.” In other words, we are asked to embrace our role as the main character and create the story we want to play in the world. 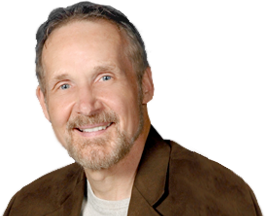 I invite you to share your personal stories where your GPS has guided you through life or you have experienced Home. Your message can inspire others to realize that they are not alone and that they can connect with the Guiding Power of Spirit to heal their lives and guide them Home to love and inner peace. Welcome Home!